Thomas Jefferson Kitts | Blog: History of Plein Air Art . 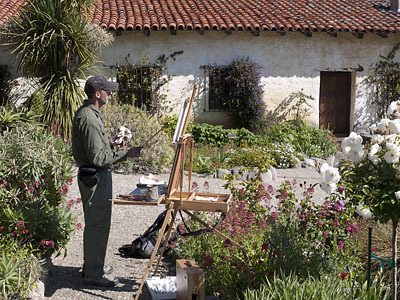 . .
History of Plein Air Art . . . This Friday I fly down to Laguna Beach to participate in the 12th Annual Laguna Beach Plein Air Painting Invitational. At the close of the 19th century, and the start of the 20th, Southern California gave birth to a unique form of American art: California Impressionism. A colorful, yet observational kind of plein air painting representative of the land and atmosphere of the place. And this same area has once again become synonymous with plein air painting. One man who may honestly be credited with much of this resurgence is Jean Stern, Director of The Irvine Museum. The Irvine Museum was established in 1992 with private funds to preserve, display, and inform the public about the masterworks of California Impressionism. But lest I be seen as trying to steal Mr. Stern's thunder, I present you with an article he wrote for PleinAir Art.net about the history of the genre. But I only offer the first two opening paragraphs. You must click on the link below to jump to the full free online article, as it has been published . . . Starting with the late 1880s and continuing into the early part of the twentieth century, artists in California painted in an artistic style which exalted the picturesque landscape and unique light of this Golden State. 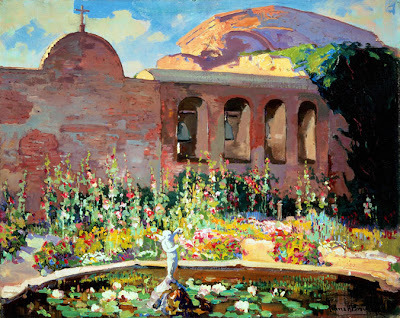 This style, which is often called California Impressionism or California Plein-Air painting, after the French term for "in the open air", combined several distinctive aspects of American and European art. Landscape painting is a time honored tradition that is inseparable from the spirit of American art. From Colonial times, American art had been governed by special circumstances unique to this land. Unlike Europe, American art was nurtured in the absence of empowered patronage. Institutions such as the monarchy or the church had been powerful determinants in the progress of European art. In turn, America’s democratic tendencies were powerful factors that led to the popularization of landscape painting as the ideal vehicle for expressing the American spirit, as it afforded an avenue to express God and Nature as one, an understanding of spirituality that disavowed religious patronage, and it created a metaphor of the American landscape as the fountainhead from which sprang the bounty and opportunity of rustic American life. I hope all of you find Jean Stern's article of interest, and learning about California Impressionism in general, as it has a huge impact on the kind of painting going on today. I will be quite absorbed over the next ten days with the LPAPA/LAM invitational so I doubt I'll have time to update my blog until after October 18th. But do expect a full report of my trip shortly after that. Until then, keep painting! . . . . Or buying paintings . . . Or whichever pleases you most! . . .
thanks for the article....and "break a leg", Thomas!